Does anyone remember the events following Independence Day 2012 when a couple of dogs went missing after they fled from their yards in search of safety after fireworks went off nearby? One of those pets was found about 1/2 mile away by neighbors who read the owner’s plea, the other, sadly, two years later was still missing. While this isn’t really an “event” we have created this as a reminder and resource for everyone over the next week. As July 4th celebrations begin, it is important to be aware that firework displays can not only scare pets, but can also harm their sensitive ears. Did you know that the time around July 4th is the highest time that pets go missing from homes? Not only because of the fireworks, but because of backyard picnics and events where people may forget to close the doors, lock the gates, and assure that their pets are safe. Luckily there are some simple things you can do to make sure your pets aren’t scared and stay safe during this time. According to behavior specialist Dr. Elizabeth Shull, low-frequency, percussive noises such as fireworks and summer thunderstorms trigger wild fear in about 20% of dogs. Even dogs that don’t usually react to loud noises may react differently to sounds such as fireworks. One of the best things is to create a “quiet space” for your pets. Find a quiet, secure, room to keep your pets in. Consider turning on a TV or a radio to help drown out the noise from the fireworks. Put items such as toys, even extra food, in the room to distract the pet during the event. And most importantly, in the event that your pet does get loose, always make sure they can be identified by collar, tag, and microchip! Make sure you have all that information handy, and frequently check on your pets to make sure you know where they are. If you have friends coming over, remind them that you have pets in the house that may be scared or skittish, and to make sure they close doors properly when going outside. 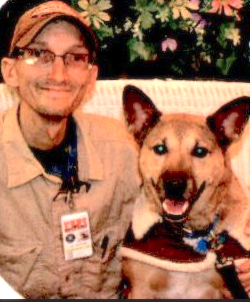 For several years, Orange Live has been sharing the good work done by Jon Nowinski and his Amity based organization, EARS (Emergency Animal Rescue Service), which was born from a series of emergency situations during an unusually brutal winter — barn collapses and large animal rescues when there weren’t many trained professionals in the area that could help. Each year, volunteer members trained hard and dedicated countless hours learning new skills and sharing their knowledge with emergency personnel (firefighters, police, animal owners). EARS grew as the go-to group, which specialized in just about anything that anyone needed in CT.
Nowinski transformed his SUV into the EARS 1 vehicle, filling it with all the equipment his group needed for a wide variety of responses. As their reputation grew, so did the needs of this volunteer organization. 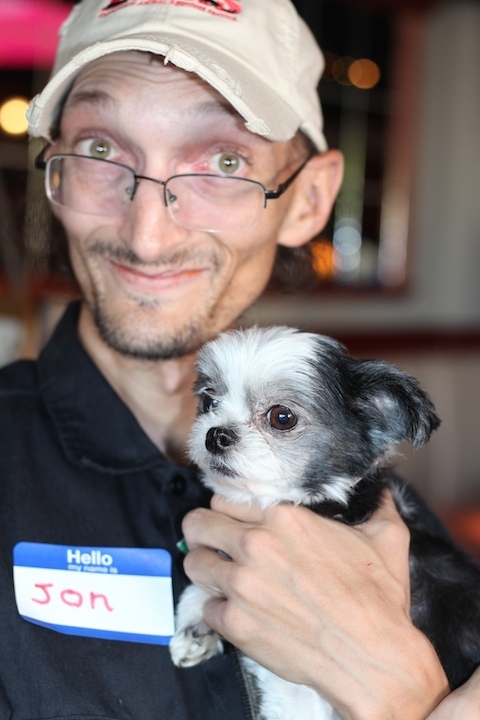 Jon landed a job with the VCA Shoreline Veterinary Referral and Emergency Center in Shelton. He saw more and more situations in which an ambulance would be a priceless addition to assist in EARS responses. Back in 2012 I had the most beautiful Golden Retriever that meant the world to me. One night, I gave him dinner, let him out and then went on a news assignment that kept me away from home for about 3 hours. Baron von Saberwolfe, 4 months before his death. When I returned, he did not greet me at the door as he had for the previous 5 years. I searched for him in the bedrooms, livingroom, under the kitchen table and he was nowhere to be found. Finally I located him under the desk in the dining room. He was lying on his side, panting heavily and his stomach was huge, about 3 times its normal size. He was obviously in pain. I put out a plea to my friend who is a veterinarian, she told me that it sounded like bloat, and to get him to the emergency hospital as fast as possible. I tried to get him into the SUV, but he couldn’t jump up, he was in so much pain. I couldn’t pick him up because I didn’t want to hurt him any more. I was frantic to get help, just so I could quickly get him to the hospital. Luckily, my brother was nearby and helped me lift Baron into the back seat after we got him to lay down on a blanket. The ride up to New Haven was excruciating. Baron was crying in the back seat where he’d always happily paced across. That was the night I had to say goodbye to my best friend. What I needed more than anything was someone who could help me, prepare me for what bloat does to a dog and explain that he would likely never return home. After searching for a used ambulance, Jon set up a gofundme page to raise enough money to purchase a good responsible vehicle. With EARS excellent reputation, the response was overwhelming. In March, after locating a used ambulance that could be transformed to accommodate animals of all species and sizes, EARS was able to buy the Rescue 2 Ambulance, the ONLY animal ambulance in CT. It took months of work to get the ambulance ready for the road. It was outfitted with cabinets for bandages, emergency clothing (the Orange Volunteer Fire Department donated old fire turnout gear to EARS). a specially equipped stretcher, several sizes of animal oxygen masks, travel crates and so much more. Since it came into service, Rescue 2 has responded to dozens of emergency situations, including several that mirror my own personal needs from four years ago. It has transported large dogs — Great Danes, Labradors, etc. that were too big for the owner to lift, or bigger than the limited area available inside a typical car or the Rescue 1 SUV. Working with the Emergency Hospital, Nowinski also has been called for some unusual patients, including a Maned Wolf from the Beardsley Zoo that needed surgery. Nowinski said he has had positive response from people around the state. When he is driving on the thruway, regular (human) ambulances will pull up alongside and the emergency personnel will give him a thumbs up. We are available on-call 24 hours a day, 7 days a week, and responds to all requests as quickly as possible. 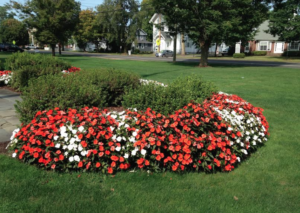 And while we primarily operate in Fairfield and New Haven Counties, we do dispatch throughout Connecticut when there is a need. As with the other aspects of EARS, our animal ambulance service has always been – and will continue to be – operated strictly through donations. We do not charge owners or veterinarians who call us, and do not require a set donation for our assistance. The way we keep going is by the support of animal lovers and the community, and we have been lucky to have that wonderful group behind us. For more information on how you can help, please read about our service, and visit our DONATE & SUPPORT page on our website. The Orange Ale House & Grille, 517 Boston Post Road, Orange will host the EARS Fundraiser Bash on Saturday, August 13 from 3 – 7 p.m.
Come join us at the Orange Ale House for a special fundraiser bash in support of EARS. There will be LOADS of activities taking place, including door prizes, raffles, music, a chance to meet members of the EARS Team, a photo and multimedia display of EARS Operations, our Rescue 2 Animal Ambulance will be on display, and so much more. Charts showing the inner workings of various animals. the original Rescue 2 lettering. Jon Nowinski attends to an injured hawk found in Orange. An injured dog is wheeled into the hospital. When a family in the Peck Lane area found a young hawk lying in their front yard on Easter Morning, they wanted to to whatever was best for him. They tried calling rescue groups, but no one was open on Easter Sunday. Then they remembered the Emergency Animal Rescue Service (EARS) that they’d seen at a recent Touch-A-Truck in Milford. Immediately after the call, Jon and Shirley Nowinski were in the EARS Vehicle en route to Orange from Westport. Jon said the homeowner did everything right, he put on heavy gloves and placed the bird into a pet carrier to keep it safe and quiet (and sought qualified help). Jon assessed the bird, which he estimated to be a couple of months old, and didn’t find any obvious injuries. “He’s young, still has his baby feathers. I think he was testing his hunting skills and something went wrong. He miscalculated on his approach and either hit a tree or the ground,” he said. With the bird comfortable and safe in a carrier in the EARS Vehicle, Jon started working the phones and was making arrangements with A Place Called HOPE, a facility in Killngworth that specializes in rehabilitating birds of prey. Within an hour of our meeting with Nowinski, the bird had arrived at HOPE and was being evaluated. EARS’ home base is in Bethany and it serves the entire state, responding to animal emergencies any time day or night. No job is too big or too small. They are there for dazed young hawks, or a barn full of horses after a fire or roof collapse, and so much more. EARS also hosts seminars and workshops throughout the area. Keep up-to-date on their activities by Liking their Facebook Page or visiting their Website. Program their number into your phone in case you ever need them 24/7— #: 203-872-PAWS (7297) / Emergency #: 203 – 247 – 0310. The Raymour & Flanigan Furniture, 538 Boston Post Road will host a free “Adopt A Pet” event featuring food, entertainment, fun, and of course animals, on Saturday, Sept. 20, from 11 a.m. – 5 p.m. The team from the Emergency Animal Response Service (EARS) will set up a special information and demonstration area with the theme of “Pet Preparedness” to coincide with September being National Preparedness Month. Look for the EARS area where visitors can get an up-close look at the Animal Rescue Truck, equipment used on emergency responses, and take part in an animal first aid demonstration. You can also meet the EARS K9 “Coyote” and learn about the job of Search & Rescue dogs as well as other types of working dogs that assist in times of disaster. Handouts on emergency pet preparedness starting in your own home also will be provided, and finally the team will be offering on-site microchipping for dogs. The cost of the microchip is $20.00 per pet, which is a one-time only cost and includes lifetime registration in the PetLink International database as well as the “EARS Connecticut Rescue Registry,” an exclusive database created by EARS to help assist owners in our state during emergencies and disasters. For more information on the microchipping, or to reserve a microchip, contact EARS directly at info@earsct.org or visit www.EARSCT.org. EARS is a nonprofit, all-volunteer, organization, designed for rapid-response to emergencies affecting animals and their owners. The team is based in Bethany, Connecticut, but responds to incidents throughout the state. With many team members locally-based, EARS has been very active in the Orange community, hosting events, presentations, and workshops for pet owners, as well taking part in town activities like the Orange Expo. One aspect that makes EARS such a unique team is their experience and training with all types of animals as well as emergency response situations. Team members are required to complete certified courses through the Federal Emergency Management Agency (FEMA) which provide the knowledge needed to conduct animal response work side-by-side with local emergency services. Additionally EARS team members are certified in special “Technical Animal Rescue” aspects, which includes work with large animals such as horses, as well as animals needing specialized response knowledge. EARS founding member Jon Nowinski shows off the donated turn-out gear. In preparation for Large Animal Training, EARS, an all-volunteer non-profit organization, put out a plea for turnout gear and helmets that would help protect the members from the elements and bites or kicks from frightened animals in the event of an emergency. Almost immediately, founding member Jon Nowinski received a response from an officer in a local volunteer fire department. Even though he could have taken the whole lot, Nowinski only took four helmets, four pants and four jackets for the members who needed them. The department’s name will be removed from the back of the jackets and the EARS logo will take its’ place. EARS is always available to assist CT cities and towns in the event of an emergency where animals are involved. They are trained and help in the rescue and transportation of pets from homes, barns, etc., whenever they are needed. Whether you’re a horse owner, a volunteer at an equine facility, or just a horse enthusiast, members of the CT Emergency Animal Response Service (EARS) are very excited to be teaming up with the Connecticut Draft Horse Rescue to present a special Equine Emergency Preparedness seminar on Saturday, Aug.23. This all-day event (9 a.m. -5 p.m.)features experts from the field of equine veterinary care, large animal response, emergency response, and others, and is going to be a jam-packed informational day. The entire event (including handouts, materials, and lunch) is being presented at $25 per person – $30 at the door. Don’t miss this great opportunity! For more information contact info@earsct.org. The flier for the upcoming training session. The last 24 hours in our region has seem some severe weather. Yesterday afternoon a tornado touched down in Wolcott, CT, just before 1:00 p.m., and this morning one touched down in Revere, MA, only 5 miles from Boston. In addition to the tornadoes, both areas were pounded by heavy rain winds, and microbursts, causing a path of damage. All of this serves as an important reminder to make sure you’re prepared for emergencies, especially in these hot summer months where the weather can be highly unpredictable and change in an instant. In 2013 severe weather events in the U.S. cased over $7 billion in damages, and resulted in the deaths of 109 people. Four tornadoes touched down in Connecticut in 2013, and even though tornadoes in our state are often smaller and less intense than other areas, the one on July 10, 2013, still left a path of damage over 11 miles long. Stronger cells are not out of the realm of possibility here in Connecticut, especially this time of year. Watch: conditions are favorable for a thunderstorm, flood, or tornado. Warning: a thunderstorm, flood, or tornado is occurring or is likely to occur soon. · When making a disaster kit, make sure you can take it with you in case of evacuation. · Always listen to weather reports on the radio or television. · Never approach downed wires or flooded areas. · If there are heavy winds, and you cannot get into a basement or secured room, stay in the center of the room, away from doors and windows. The Emergency Animal Response Service (EARS) will host a community meeting at Lock, Stock, & Barrel Feed Store, 770 Amity Road, Bethany, tomorrow, Saturday, Jan. 25 from 3-5 p.m. These meetings are open to anyone interested in helping animals and meeting members of the team, as well as obtaining information on how your group or organization can get involved and bring away important information about caring for animals in emergency situations. Visits to snow-filled parks, hikes in the winter woods, and outside playtime are all fun ways to enjoy this weather with your pets, but this time of year also brings an increase in dangers that all pet owners need to be aware of. As winter really announces its arrival with Saturday’s snowstorm, you may have already prepared your house, and you may have gotten your car ready, but have you winterized your pets? You may think it’s silly to see a dog dressed in a sweater, coat, or even with a scarf and boots on, but it’s just as important to bundle them up from the cold as it is for you. Even on the coldest of winter days, most dogs still want to spend time outside, and you should closely monitor them when they do. Before taking your dogs out or letting them run around in the yard, check the weather forecast and temperature, and remember that pets outside are susceptible to the very same dangers as people such as frostbite, hypothermia, and illnesses. Also like people, younger and older dogs should not spend as much time outdoors, as well as dogs with health issues. Winter illnesses are no fun for people, and can quickly lead to respiratory infections or worse if untreated, and the same is true for pets. The signs of illness in pets are similar to that in people as well, including coughing and sneezing, runny nose, congestion, shaking/chills, etc. When your pets come in from outside be sure to take a moment to check their ears, paws, and tail, and clean off any ice or snow that may be sticking to them. Make sure during the winter to provide extra blankets and warm spaces for your pet. If you notice them shivering or think they are cold when they come in from outside, one solution is to put a towel into the dryer for a few minutes, and then give it to your pet so they can get warm. Do not use hot water to wipe them down, as going too fast from cold to hot can put them in to shock. The greatest threats to your pet during winter are chemicals and ice treatments, and every year these cause more injuries and deaths in pets than any other factor. One of the most common emergency pet calls is for animals that have ingested antifreeze that had been left around the house. Antifreeze is extremely toxic to pets, and even just a few licks can cause fatal results. Always make sure you clean up containers immediately, and also make sure you clean up any spills of antifreeze chemicals. Another danger is ice-melt products, many of which are toxic to animals, and when licked by a pet can cause serious internal damage. When we come in from spending time outside we wipe our feet, and the easiest solution to keeping your pet safe is to stop and do the same for them. Finally, if you do let your dogs off-leash in your backyard or when bringing them to their favorite park, there are some dangers to be aware of there too. Icy spots pose the same risk to animals as to people, as not only do they not notice them, but often dogs are running much faster than we are and are prone to slipping even more. If you have an invisible dog fence on your property, make sure you ask the company if it will be affected by snowfall, as well as what happens if your power goes out. During last year’s February blizzard many owners found out that their invisible fences failed with the snow as their dogs ran through the boundary. Another danger is unstable trees and branches that fall because of heavy snow and ice. Often these branches are brittle, sharp, and can be extremely dangerous to pets. It’s best to keep your dogs away from them. And perhaps the scariest dangers to your dogs in parks are frozen ponds, rivers, and lakes. Dogs don’t know where the solid ground ends and the frozen water begins, and when there’s snow covering the ground it all looks the same. It only takes a moment for them to fall through the ice! If you think that your pet may have been injured or is exhibiting health issues from winter weather you should always contact your veterinarian immediately. It’s also important to have the contact information for the nearest emergency vet clinic. The closest to Orange are the VCA Shoreline Veterinary Referral and Emergency Center located at 895 Bridgeport Ave in Shelton (203-513-4714) and the Central Hospital for Veterinary Medicine located at 4 Devine Street in North Haven (203- 867-5195). If you have any questions about winter weather pet tips or emergency issues please don’t hesitate to contact us at info@earsct.org and visit our website for more tips at www.EARSCT.org. The Emergency Animal Response Service (EARS) is an all-volunteer organization dedicated to rapid-response to animal emergencies as well as community outreach and education of important pet preparedness issues. The team operates throughout Connecticut, but is centered in the Orange/Woodbridge area.